Embedded XMC features AMD 6-head GPU. Based on AMD's Radeon E8860 GPU, featuring 2 GB of GDDR5, Model M596 is capable of routing simultaneous digital and analog streams in multiple output formats. XMC integrates graphics language acceleration, parallel processing engines as well as video and audio decompression units. It also supports advanced graphics and video standards including DirectX, OpenGL, and Shader. With rugged design, XMC is suitable for harsh environments that have versatile video overlay and capture requirements. 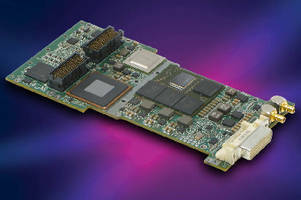 Chatsworth, Calif. – Aitech Defense Systems Inc., a pioneer in true embedded and mission critical computing technologies for environmentally-demanding, mission-critical applications, has released the rugged M596 embedded video and graphics XMC based on AMD’s Radeon E8860 GPU, featuring 2 GB of GDDR5. Capable of routing simultaneous digital and analog video streams in multiple output formats, the rugged XMC is ideal for harsh environments that have versatile video overlay and capture requirements. Designed for use in either advanced civil or military aviation or ground vehicle systems, applications include fixed- and rotary-wing mission and cockpit display computers and heads-up displays. Additionally, it can be used in electro-optical (EO) video camera, EO night vision and Infrared (IR) video frame grabbing, multi-role tactical mission displays found in advanced 2D and 3D C4ISR and EW video processing systems. The new M596 integrates several hardware engines, including graphics language acceleration, parallel processing engines as well as video and audio decompression units. It also supports the most advanced graphics and video standards including DirectX, OpenGL and Shader. Many of the XMC’s output video channels are provided through the E8860’s native integrated video ports for processing digital HDMI, DVI and SD-SDI video and analog NTSC/PAL RGB, S-video, including RS-170 and STANAG 3350 protocols. A sophisticated FGPA can be added alongside the GPU to support even more video protocols and formats as well as signal conditioning and compression. An eight-lane PCIe link that connects the host system with the new XMC ensures high-speed transfer of graphics and video. The M596 is available with support for VxWorks, INTEGRITY, Windows and various distributions of Linux.